The young vegetation on the north side of Upper Muir Inlet in Glacier Bay National Park is developing dramatically differently from older vegetation a few km away. Today, five decades after the retreating Muir Glacier exposed my youngest study site (Site 1) to plant invasion, it supports an open shrubland of willows with most of the ground still carpeted with low-growing Dryas drummondii. At the same age (in 1995), the next older site (Site 2) had no Dryas and was a dense thicket of 6 meter tall Sitka alder shrubs. 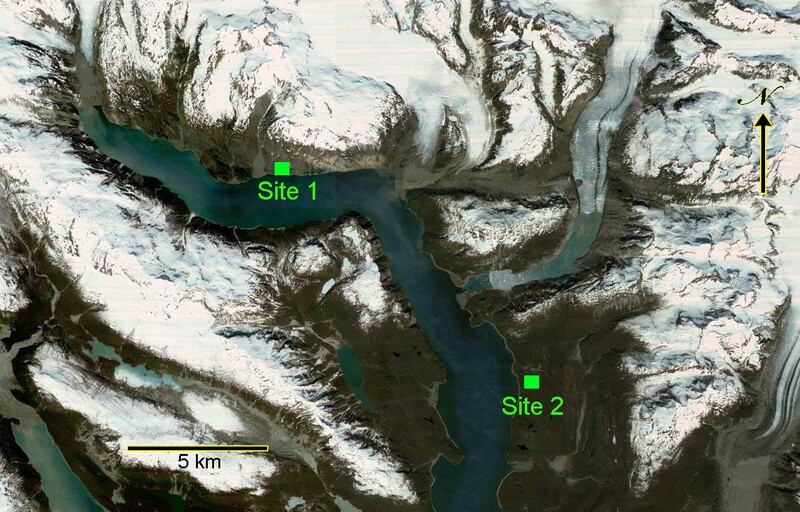 The distinct successional pathways being followed at these sites have critical ecological differences (e.g., alder is an important nitrogen fixer) and suggest that inferring ecological change from a sequence of different aged sites in this part of Glacier Bay does not work. Can seed rain explain this? My favorite hypothesis to explain this is that early seed rain of alder differed between the two areas. Ice margins in Glacier Bay have been retreating to the north for almost three centuries, and invading newly exposed terrain requires that plants can migrate as fast as the ice retreats. Alder was apparently doing a good job of chasing the ice along most of Muir Inlet where my reconstructions of invasion histories at four study sites confirm that alder was an important early invader. Why couldn’t alder reach Site 1? Only the youngest site was mostly free of alder after 50 years of invasion. Topography might explain why alder seeds arrived and established early at other sites in Muir Inlet but not at Site 1. Alder could march north in Muir Inlet without encountering major obstacles until it reached Site 2. North of there, migrating along the eastern shoreline of the inlet required crossing two glaciers and a 2 km face of the bedrock escarpment west of Riggs Glacier. On the western shore the route was more direct through Glacier Pass, the valley west of White Thunder Ridge. Alder could have moved along that route to the south shore of Muir Inlet directly across from Site 1. Indeed, that south shore today supports dense shrub thickets dominated by alder even on surfaces the same age or younger than Site 1. But on the north shore, where Site 1 is, alder is scarce. Some alder seeds probably found their way across the 2 km wide marine inlet, but not enough to form dense early thickets. The stark contrast between the north and south shores of Upper Muir Inlet is hard to explain any other way. Surfaces just 2 km apart which were exposed by the glacier at the same time are now dense alder thickets on the south side but are open Dryas and willow communities on the north side. Has this happened elsewhere in Glacier Bay? Upper Muir Inlet is not the only part of Glacier Bay where alder does not dominate on 50 year old surfaces. In the northern part of the west arm of Glacier Bay, surfaces as old as 100 years are still dominated by willows and cottonwood with little or no alder. Although it took more than a century (1750 to 1860) for ice to retreat 50 km and expose the southern half of Glacier Bay, only 20 years were required for the next 35 km of retreat up the west arm. That’s 1.75 km per year, probably many times faster than alder can migrate. This produced a situation in which surfaces exposed after 1880 were 10 to 30 km from seed-bearing thickets of alder. Plants like Dryas and willow with smaller seeds and shorter generation times (from seed to seed-bearing plant) can migrate faster and keep up with the retreating ice, and they have been much more successful in the upper west arm than alder. This is consistent with the idea that although most of Muir Inlet was colonized quickly and thickly by alder, surfaces at Glacier Bay exposed far from mature alder thickets will support early communities of other species. Why don’t the scattered early alders spread? When I established the study plots at Site 1 in 1990, the surface was about 22 years old. There were no alder shrubs or seedlings in the plots, but there were a few alder shrubs nearby and scattered widely throughout the area. These alders were 2 m tall and had probably begun to produce seeds–there were small alder seedlings near them. In the 28 years since then, seeds from those alders could have populated the entire area with new alder shrubs. But in 2018 only two of the five study plots had any alders, and those plots had less than 3% alder cover. This suggests that the lack of alder there may not be due to a lack of alder seeds but to something else. I will take a look at those pioneering alders and what they tell us in a new post.